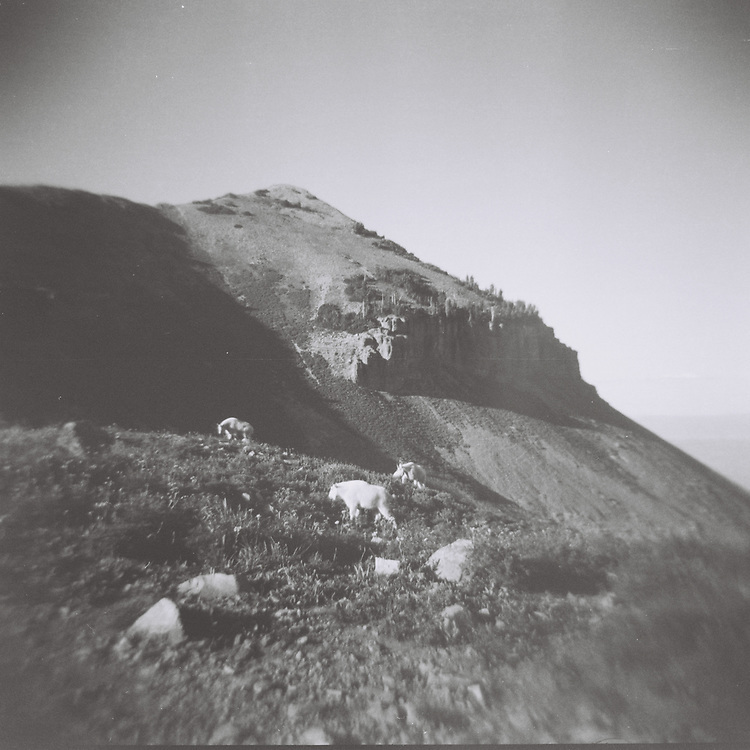 Three mountains goats grazing on wild flowers and grass at the top of Timp. The cliff in the background was created by a glacier moving down the mountainside. Homesick. Growing up, I felt this mountain was an integral part of my internal and external landscape. Timpanogos watched over me as I climbed the cherry tree in our backyard, as I fought with boys who didn't let me play soccer with them, as I hiked with my highschool friends, as I snowboarded down her slopes. Seeing this picture makes me very very sad I live so far away from this mountain, and thankful that I did live in her shadow for my childhood. I had no idea what was on this roll. In retrospect I'm not surprised I took this photo because I have other developed rolls from this 3-day hike. Seeing this photo reminds me of the little tin shack we slept in the night before this was taken. It was reasonably warm inside and we slept well, until around 5 in the morning when a sound like thunder and a million pots and pans being dropped at the same time startled us awake. We could see through the doorway that the sun was emerging and the sky was clear, so no thunder. Outside the shack we found half a dozen mountain goats running over a corrugated metal sheet from the shack. The goats were unfazed by us for the entirety of our stay on the mountain. I hope people think of how many beautiful places there are just outside the reach of human control.